POPULAR WITH DIVERS FOR HEAVIER CUTTING PURPOSES, THEY WILL EASILY CUT THROUGH JUST ABOUT ANY ENTANGLEMENT. 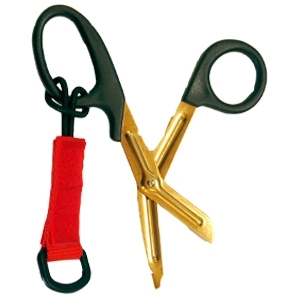 Shears are constructed from Marine grade stainless streel for better corrosion resistance. Coordinating with our line of harness pockets are our unique cutting device sheaths that snap into our pocket daisy chain loops. Using heavy-duty Annex clips that slip through daisy chain loops and snap into place. These clips are rugged and won’t come unclasped underwater. To remove, you must pinch the ends slightly to get the clip to release…easy enough, but not so easy that it comes undone all on its own. The sheath clip will also close around cylinder hose retainers, wrist straps, gaiters or a chest strap. If desired, the Annex clips can be removed and the sheath worn on a standard 2-inch waist belt. 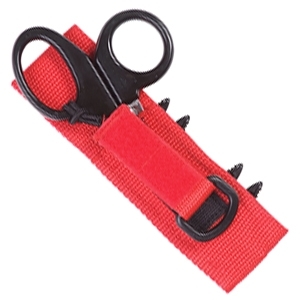 A quick-release Velcro lanyard keep the shears firmly in place. Shears are also sold individually (no sheath). Apply a light coat of silicone grease to the blade to help protect against corrosion. Rinse in freshwater and allow to air-dry after use to keep shears in best condition.